So in january.. one of the biggest discussions was on Cher Lloyd’s new hair-doo. PLEASE CAST YOUR VOTE ON THE POLL AT BOTTOM OF POST! Cher was papp’ed sporting a ‘Hip Hop’ up-doo/Mohican with cascading curls in a mouth-watering (i may speak for myself) plum red as seen on Cheryl Cole during the X Factor Finals. So catching this hairstyle from all angles… I actually Like it ON HER.. 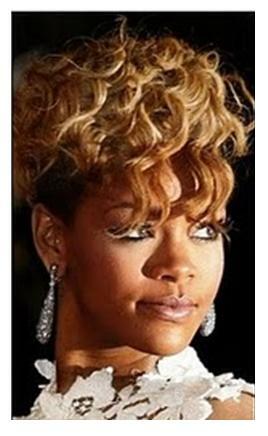 Although Cher is being criticised for doing a copy cat of Rihanna (below), this hairstyle too has also been seen on young singing sensation Willow Smith.. I think the Hairstylist was doing right by going with this look it simply just GOES with Cher’s ‘Image’.. whether we like it or not.. Cher as a product/artist belongs in the R&B/Hip Hop Category. Rumoured to recently be signed by Jay Z.. We all know Jay Z will pull out ALLL the stops necessary to get her to Fit in. I Must also comment that i Love the Jumper on her to.. Cher is on the list for #thepeopleiwouldlovetostyle she is like the perfect lil’ Dolly.. The X Factor Team must have truly had a ball when styling her.. (apart from the Diva tantrums of course *eeek*). Rihanna Does look stunning, as always.. but i do feel sorry for cher.. Its USA. There just aint enough hairstyles for all of us. But this weekend.. Teen Today posted YET ANOTHER picture of Cher going COMPLETELY BRIGHT RED.. THis time…I just DO NOT LIKE IT!! And this time id DEFINITELY looks very… very familiar.. Previous Post STYLIST ADVENTURE: BEHIND THE SCENES OF ME ASSISTING ON ‘BOYS BY GIRLS’ PHOTOSHOOT!! Next Post GOSSIP: PARIS HILTONS NEW MUSCLES?.. OR IS IT JUST?… YOU DECIDE! !